◎ MATERIAL - Our Portable Wardrobe made from high quality Non-woven fabric cover, waterproof fabric tiers, sturdy steel tube and PP Plastic Connectors. 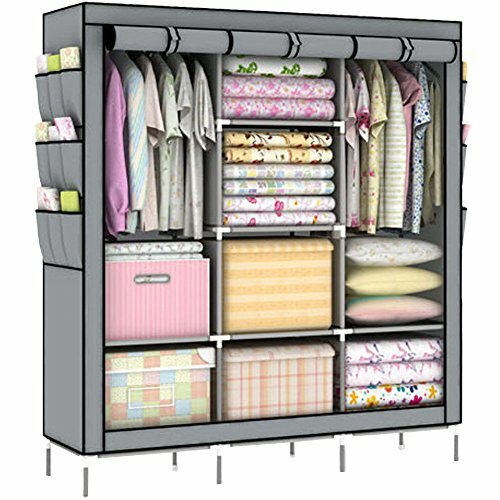 ◎ SPACIOUS STORAGE CLOSET - Clothes Organizer size is 69\" x 51\" x 17.5\". 2 Movable clothes hanging rod and 6 storage shelves, with 9 side pockets each side. offers you extra space your clothes in top condition. ◎ EASY TO INSTALLATION -DIY Free Combination, Easy To Assemble And Detach, MANY kinds of combinations. Following the instructions, you\'ll have it assembled in Short time. ◎ DUSTPROOF & WATERPROOF - Zippered dustproof cover offered to keep your item away from dust and water-proof fabric tiers are easy to clean. ◎WARRANTY -Awkli is a brand registered business, we provide customers with high-quality products, pay attention to customer experience, we know you will love this wardrobe,but if you have any questions, You can contact us,simply send it back within 90 days for a full refund,we will be fully responsible.